Episode 326, March 26, 2019. Izzy is back with us this week! We get Mark's thoughts on finally seeing the KISS End of the Road tour. We also take a look at 12 shows that have had ticket sales reported and see how they stack up against the best selling KISS tours based on average ticket sales. Yep... average is back! Here is how you calculate average... The mean is the average of the numbers. It is easy to calculate: add up all the numbers, then divide by how many numbers there are. In ... Más informaciones other words it is the sum divided by the count. We can't wait for the excuses! Oh and 7-11 pasta? Really! Forget the haters, we won! 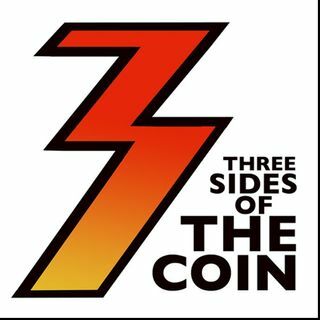 Every Sunday at 8pm PT Three Sides of the Coin brings you two hours of KISS radio! Three Sides of the Coin Radio is on the Monsters of Rock channel on the Dash Radio Network. We program the radio show, we pick the songs... no corporate overlord telling us what to play. We play the songs the fans really want to hear. Not only do you get a KISS podcast every week, you now get a two hour radio show playing nothing but KISS every Sunday! Since launching in 2012 Three Sides of the Coin has been viewed or listened to over 5,000,000 times. Three Sides of the Coin has been joined by special guests including former KISS lead guitarist Bruce Kulick, Eddie Trunk, WWE Superstar and lead singer of Fozzy Chris Jericho, Angel lead guitarist Punky Meadows, Five Finger Death Punch guitarist Jason Hook, Vinnie Vincent Invasion and Slaughter lead singer Mark Slaughter, Twisted Sister’s Dee Snider, comedian Craig Gass, KISS’ former business manager Chris Lendt, the Black Veil Brides' Andy Biersack, Frank Munoz associate producer for Ace Frehley's Anomaly album, award winning songwriter Adam Mitchell, Ed Kanon (Peter Criss' drum tech), Kevin Valentine (drummer on KISS' Psycho Circus album). Three Sides of the Coin was picked (October 2013) as a 'What's Hot' podcast by Apple's iTunes.